Four (4) Dialysis Treatment Stations in this One (1) Highly Mobile Dialysis Vehicle! Mobile Healthcare Facilities’ 30′ (9M) mobile dialysis facility is the BEST “Large” off road capable mobile dialysis unit in the mobile dialysis marketplace. This Dialysis Facility is specially designed to provide premium dialysis treatment to patients suffering from kidney failure. Hemodialysis is the most common method used to treat advanced and permanent renal disease. This mobile dialysis vehicle is one (1) of the most advanced systems for hemodialysis treatment that can travel to the most remote locations and still treat four (4) patients concurrently. This mobile dialysis unit is a specially designed mobile dialysis facility specially equipped with dialysis equipment that performs the dialysis operations. This unit has four (4) patient dialysis stations. Each station consists of the following: reverse osmosis pre-treatment filters, individual reverse osmosis machines (with heat sanitation), a patient dialysis reclining chair, and a patient individual entertainment system. The only differences between our mobile dialysis facility and brick and mortar dialysis treatment facilities are: 1) our ability to be mobile, and 2) our ability to serve different locations where there are patients requiring dialysis treatment. Being mobile, we still do not compromise on our standards of care. Our mobile dialysis clinic meets all US healthcare codes for a hospital dialysis facility. This is an expertly engineered dialysis care clinic that is capable of multiple treatments per day, over many years of service. 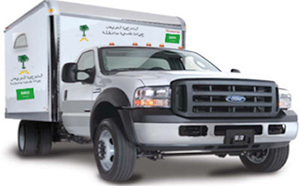 This mobile dialysis vehicle is built on a heavy-duty chassis with good ground clearance. It comes standard with 2-wheel drive; however, there is an optional upgrade to 6-wheel drive. With the 6-wheel drive option, this mobile dialysis clinic is capable of traveling over some of the worst roads on the planet. We can also add winches to both the front and back for extra off road capabilities. This highly technical and maneuverable Mobile Dialysis Unit can be set up and struck by as few as four (4) people in less than twenty (20) minutes. This mobile dialysis truck is all aluminum and it has four (4) expandable walls. These expandable walls provide the required working space (inside the mobile dialysis clinic) for all of the required equipment, supplies, and personnel. Inside this facility, there are four (4) patient dialysis treatment stations, a water treatment room, and a nurse’s station. Our mobile dialysis unit’s structure consists of an all aluminum frame and body 30′ X 8.5′ (9M X 2.6M). This facility also has four (4) expandable walls for additional working space inside the mobile dialysis clinic. This mobile dialysis facility has four (4) patient dialysis treatment stations, a water treatment room, and two (2) nurses’ stations. This mobile dialysis unit’s treatment capabilities consist of four (4) patient dialysis treatment stations. 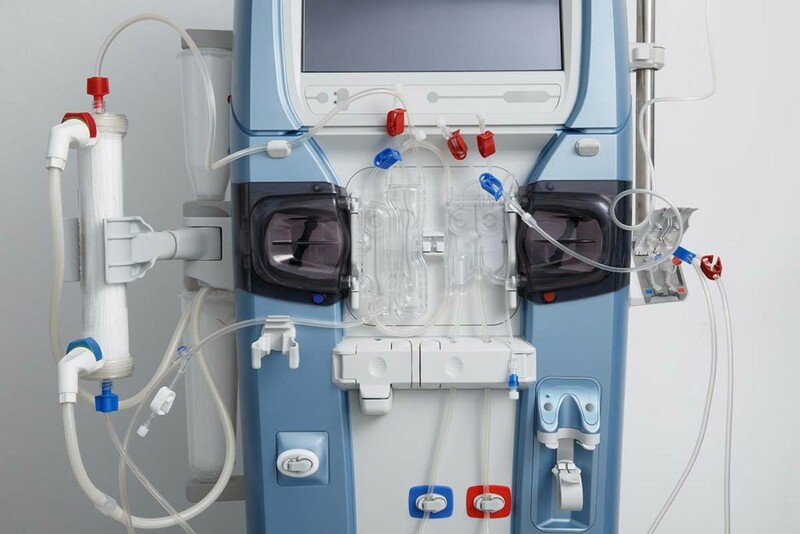 These specially designed and equipped patient stations have the finest dialysis equipment in the marketplace. Our dialysis equipment consists of the following equipment: pre-treatment filters (treatment of water for the reverse osmosis machines), individual reverse osmosis machines (with heat sanitation), and individual patient dialysis machines (Fresenius, B. Braun, Baxter, Gambro, Renatron, or Zyzatch) (YOUR CHOICE). Also, each dialysis station has a reclining chair and an individual entertainment system for each patient. Providing YOU, the Doctors and Nurses, the perfect mobile healthcare facility to properly examine and treat YOUR remote patients!
! FLOOR PLAN AND PRICING ! 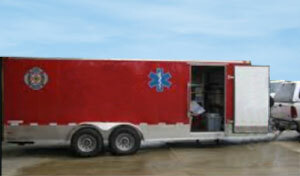 To see the floor plan and pricing for this Mobile Dialysis Clinic (30')(9M), Click on Button Below! 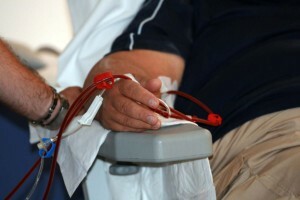 Why Mobile Healthcare Facilities’ Mobile Dialysis Clinic? Four (4) patients dialysis treatments concurrently. Dialysis treatment is required for people living in remote places..
You need to provide dialysis treatment services to several different far away locations. Mobile Healthcare Facilities is the only company who can provide you with this type of dialysis treatment unit. You will be pleasantly surprised with our prices compared to our competition! Compare this Mobile Dialysis Clinic to our competitors, and I guarantee you will choose our Mobile Dialysis Clinic. That is why we work with our customers to provide them a solution and not just a product. With the BEST in Quality at the LOWEST Prices in this Market! © Copyright 2019 Mobile Healthcare Facilities LLC. All rights reserved.